DocuCabinet is an easy-to-use document management software for small to medium sized businesses and home users. It allows you to capture, scan, store, index, organize, retrieve and search for all your scanned papers, image files and computer documents. Documents are compressed and stored in a filing structure similar to a traditional paper filing cabinet system with cabinet-drawer-folder hierarchy. You can add title, text notes, value, dates, and categorize it from a pre-defined list with associated index keys. All index information can later be used to quickly search or group documents. You can even assign a date to a document so it will remind you for future action. 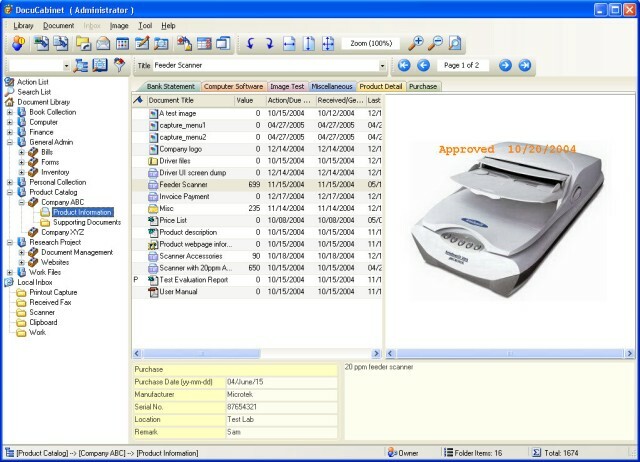 The software has packed many handy functions into one product, such as multipage scan, ADF support, batch filing, saving in TIFF or PDF, imaging viewer and editor, image annotations, password protection etc... DocuCabinet also supports archives of computer generated files such as Word, Excel, PDF, or Zip files etc. Image type document can be captured from a variety of sources such as scanner, Windows clipboard, import files, or printer output (via the bundled virtual printer driver). There are functions to perform image correction (auto trim border, despeckle, deskew), and for multi-page image manipulation (extract, re-arrange, combine etc.). The whole set of documents repository can be easily cloned for backup, or transferred to CD or DVD for permanent and off-site archives. DocuCabinet has a built-in simple and effective user access control for restricting access to the cabinet/drawer/folder structure. Documents can be instantly made sharable to other users connected by networking computers. DocuCabinet is very easy to set up and get running quickly, in a few minutes you can start filing and organizing your documents. For a small group of users, it can run in multi-user operation just using peer-to-peer connected computers, it is not necessary to use a dedicated file server. This site does not contain serial number, crack, keygen DocuCabinet serial number : serial number is the simplest type of crack. A serial number(cdkey,product key,etc) is register the program as you may already know. a crack or keygen may contain harmful software. If you cannot find the exact version you want, just give it a try. for more information read .nfo/.txt/.diz file include in zipped file.